Whangaumu Bay has a wide white sandy beach which is safe to swim in and boats can launch at all tides. Our family beach home is situated across a quiet no exit road looking over a public reserve and the water from the main lounge and living area upstairs. Upstairs also has 2 double bedrooms, (one with a cot), a bathroom with a shower over the bath, and a large deck with the BBQ and large outdoor table. This deck is totally secure for little ones. Downstairs has another large lounge, with a mini kitchen - jug, toaster, sink and microwave. One of the three double bedrooms here also has a single bed in it. All beds are comfortable. All rooms open to outside. The downstairs bathroom only has a shower. 2 flat screen TVs show Sky. Wireless broadband is available on asking. The large covered downstairs deck protects an older lounge suite beside the hammock. The trampoline has a safety cage and the small caravan is for small children to play in. The other 2 caravans are of the older vintage but comfortable for sleeping odds and sods or for those who like the quieter morning sleep ins! When other attractions call, coffee and more is only 5 mins away! Tutukaka has 4 restuarants, a few tourist shops and a store which also sells petrol. From the Marina go outon the 'Perfect Day' for a day's snorkel at the world famous dive ground of The Poor Knights. Ngunguru Village has 3 more resturants, store, and the recreation centre with 9 holes golf course, tennis and bowls. Walks and other beaches both flat and surf are all along the Tutukaka Coast. We enjoy letting our home esp. to extended families. Over Christmas we prefer 5 to 10 day bookings. We have been married nearly 50 years and have 3 married daughters and 8 grandchildren. We all love holidaying as much as possible at Whangaumu Bay with all the cousins being together. Boating, swimming, kayaking, spear fishing, walking, coffee out and lazing around are what we do well! We are a retired professional couple who love travelling abroad and around NZ when we aren’t gardening on our large life style block in South Auckland. When this property came on the market it was being run as a small camp. We’d stayed here in previous summers and loved everything about the beach and the whole Tutukaka Coast. We purchased a relocatable one story home and then realised we needed a large two story home! In giving it a make over we created a home away from home but one surrounded by peace and tranquillity looking out over the beach. Tuis are everywhere. The home especially suits extended families. On days you don’t feel like being on the beach or doing other activities you can just relax, read a book and watch those on the beach from inside. The upstairs is a home in itself with its enclosed deck for the little ones. This deck has a large outdoor table and a BBQ. Downstairs is great for the overflow and it’s covered deck with it’s old comfortable furniture and hammock faces sunny north. From there you can watch the young ones play. You can eat on the outside dining table. The kayaks, 2 singles and a double are available. Open style, very sunny. Fully equipped. Absolutely loved our stay here! Our large family all fit with room to spare! The kids loved being able to play on the tramp and in the sandpit! Was great for when it wasn't quite good enough to go to the beach and in the evenings. Wicked outdoor ablution block, everyone enjoyed the outdoor shower and bath. Great family Bach and location! Spacious, cosy, tidy bach with fantastic location! Spacious, cosy, tidy bach with fantastic location! Lot's of room for the kids to play inside and outside. Lower level of the house was a little less maintained. We had a wonderful family time in the bach, many thanks!! Excellent accommodation, lovely warm and sunny, beautiful spot, plenty of room for all. Excellent accommodation, lovely warm and sunny, beautiful spot, plenty of room for all. We really enjoyed our stay here and would have loved to have stayed longer. Awesome location doesn't get any better! Very homely accommodation. We had a wonderful time. Great place for kids with hammocks and trampoline and beach across the road. Loads of space and bedrooms. Great hot water shower outside for after the beach. Internet and sky tv great bonuses! Thank you Calvert’s! Tutukaka Coast has been recognised as stunning area of NZ for both scenery, beaches and short walks. Within a 15 min drive are several beautiful beaches offering both calm swimming and surf. Our beach, across the road, is a flat water beach and is great for swimming on all tides. Boats can be launched off the beach. We offer a mooring. Daily trips leave fromTutukaka Marina to the world famous diving and snorkelling area of the Poor Knights. We recommend the Perfect Day for snorkelling and sightseeing. 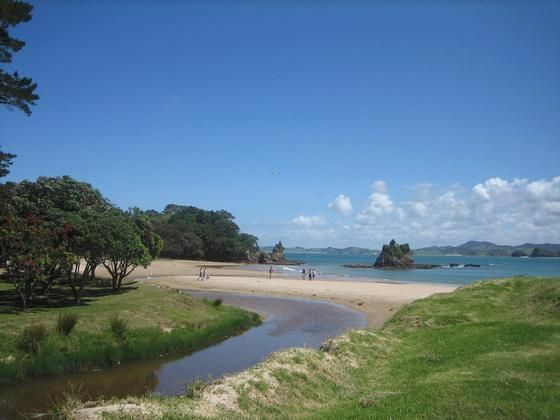 A special dive site is the Waikato. Book a fishing trip.